NOTICE: Activation key must be used on a valid Steam account, requires internet connection. 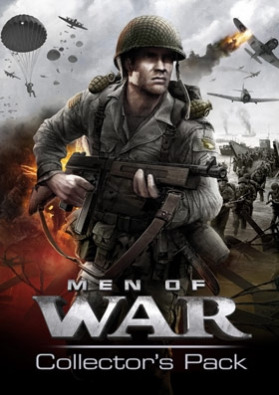 MEN OF WAR: COLLECTOR'S PACK	Men of War (English, Français, Deutsch, Italiano, Español, Russian) Men of War: Red Tide (English, Français, Deutsch, Russian) Men of War: Vietnam Special Edition (English, Français, Deutsch, Italiano, Español, Russian, Polski) Men o… f War: Assault Squad (English, Français, Deutsch, Italiano, Español, Russian, Polski) Men of War: Assault Squad GOTY (English, Français, Deutsch, Italiano, Español, Russian, Polski) Men of War: Condemned Heroes (English, Français, Deutsch, Italiano, Español, Russian) SYSTEM REQUIREMENTS Minimum: Operating System: Windows XP SP3, Vista SP1, Windows 7 Processor: Intel Pentium 4 3GHz or AMD Athlon 64 3000+ Memory: XP – 1 GB RAM, Vista/Windows 7 – 2GB RAM Video card: Shader Model 3.0 compatible graphics card with 128MB Video Memory Sound card: DirectX 9.0c compatible sound card Hard disc: 15GBRecommended: Operating System: Windows XP SP3, Vista SP1, Windows 7 (Works on Win8,win10) Processor: Intel Core 2 Duo 2.33GHz or AMD Athlon 4400+ Memory: 2GB RAM Video card: Shader Model 3.0 compatible graphics card with 256MB Sound card: DirectX 9.0c compatible sound card Hard disc: 15 GB Men of War© 1C Company 2008. Developed by Best Way. All rights reserved. This product contains software technology licensed from GameSpy Industries, Inc. (c) 1999-2008 GameSpy Industries, Inc. GameSpy and the «Powered by GameSpy» design are trademarks of GameSpy Industries, Inc. All rights reserved. Uses Miles Sound System. Copyright (C) 1991-2008 by RAD Game Tools, Inc.Men of War: Red Tide © 1C Company 2009-2012. All rights reserved. This product contains software technology licensed by Best Way. © 2009 All rights reserved.Men of War: Assault Squad GOTY© 1C Company 2012. Developed by Digitalmindsoft. All rights reserved. This product contains technology licensed by Best Way. This product contains software technology licensed from GameSpy Industries, Inc. © 1999-2012 GameSpy Industries, Inc. GameSpy and the «Powered by GameSpy» design are trademarks of GameSpy Industries, Inc. All rights reserved. Uses Miles Sound System. Copyright © 1991-2012 by RAD Game Tools, Inc.Men of War : Vietnam Special Edition © 1C Company 2011-2012. All rights reserved. © 2011 This product contains software technology licensed by Best Way. All rights reserved. This product contains software technology licensed from GameSpy Industries, Inc. (c) 1999-2011 GameSpy Industries, Inc. GameSpy and the «Powered by GameSpy» design are trademarks of GameSpy Industries, Inc. All rights reserved. Uses Miles Sound System. Copyright (C) 1991-2011 by RAD Game Tools, Inc. Box art image by www.milpictures.com. Men of War : Condemned Heroes © 1C Company 2012. All rights reserved. © 2012 This product contains software technology licensed by Best Way. All rights reserved. This product contains software technology licensed from GameSpy Industries, Inc. (c) 1999-2011 GameSpy Industries, Inc. GameSpy and the «Powered by GameSpy» design are trademarks of GameSpy Industries, Inc. All rights reserved. Uses Miles Sound System. Copyright (C) 1991-2011 by RAD Game Tools, Inc.